The PassREg Projet ended in April 2015. 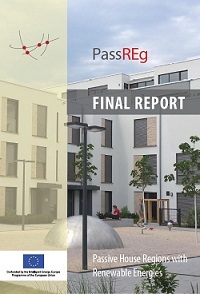 PassREg aimed to trigger the successful implementation of Nearly Zero Energy Buildings (NZEBs) throughout the EU, using Passive House supplied as much as possible by renewable energies as the foundation. Several European municipalities/regions were already committed to energy efficient Passive House principles (dictating maximum heating and cooling demands of 15 kWh/(m²a) each in new builds) and to covering the very low remaining energy demand in these buildings with energy from renewable energy sources. Along with other best practice examples, the experiences from these front runner regions helped pave the way for other EU regions to achieve the EU's call for Nearly Zero Energy Buildings by 2020. This project was thus based on European regions/municipalities that either were already front runners with a large number of Passive House buildings or were striving to become such regions (aspiring regions). Through PassREg, the front runner regions that had already implemented successful, cost effective strategies were optimised and made visible. Lessons learnt supporting the implementation of PassREg concepts through both successful regional models and best practice examples served as a basis to be adapted and implemented in aspiring regions.